Gathering My Roses: Joey Junior Purse Organizer: Review & Giveaway CONTEST CLOSED! Joey Junior Purse Organizer: Review & Giveaway CONTEST CLOSED! 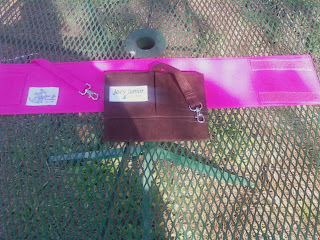 Recently, Liz and I were blessed to each receive a Joey Junior Original Purse Organizer. The organizer is both functional and very pretty! It eliminates the clutter found in almost every woman's purse and it does so with style. African Leopard, Forest Camouflage, Candy Apple Red, and more. has Velcro to help keep the Organizer upright. Six (6) pockets can hold your cell phone, PDA, small items, business cards -- you name it! There is also a leather tether and key clip to keep your car / house keys close at hand. - Keep everything visible and accessible. - Velcro keeps the Organizer upright. Make changing handbags easy! - Slip items easily in and out of pockets. - 6 pockets will hold your cell, PDA, cosmetics, and other items. - Joey Junior provides a special pocket for business cards! - Secure your keys with the handy key clip & tether. - Soft fabrics protect eyewear against scratches. - Your favorite color or pattern in Classic Fabric or Luxury Ultra Suede. The Joey Junior also comes in Luxury Ultra Suede in colours such as Black Beauty, Rose Red, and Tahitian Sand. 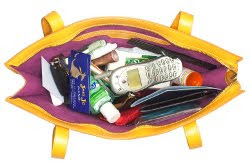 - Roomy pockets hold most of your items, including a cell or PDA. - Stands upright outside your bag. - Soft fabrics protect eyeglasses against scratches. The Joey Junior Mini Organizer is also perfect for the car! Keep all of the items that usually slip-slide away while traveling in one safe place -- I love that. It fits perfectly in my center console! The wonderful folks at Joey Junior have graciously offered one of our lucky readers a chance to win their own Joey Junior Original Purse Organizer! MANDATORY ENTRY: Visit Joey Junior and choose the style and colour that you'd love to own, then come back here and leave a comment! 3. Follow @MysticRaindrops on Twitter -- leave your Twitter name for verification! 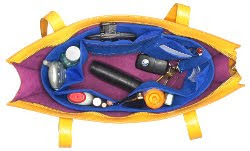 @GeorgiaMist Win a Joey Junior Original Purse Organizer! PLS RT! 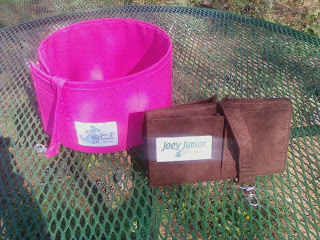 DISCLOSURE: We received two (2) complimentary Joey Junior Purse Organizers for the purpose of review. We were under no obligation to review these items. We received no monetary compensation. The opinions expressed are based on our own use and experience with the items. i entered the cowgirl chocolates giveaway 8) mmm! I would love to own the Original Purse Organizer Classic Fabric in pretty in pink. Following Gathering My Roses PUBLICLY via Google Friend Connect. These are so cute and functional! How can you beat that! 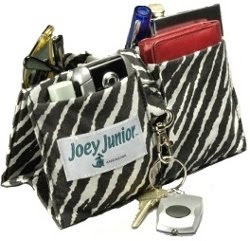 I would love the Joey Junior Original Purse Organizer in Mountain Zebra!! I like the original classic in midnight black! Also entered in the Olay Total Effects giveaway. 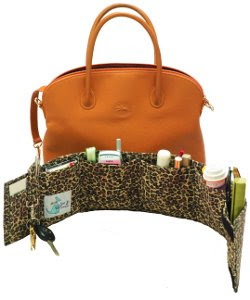 I like the Joey Junior Original Purse Organizer in Mountain Zebra! The Classic Fabric in Tasmanian Orange for me! I'm following Georgia Mist on Twitter [4emsmom}. I'm following MysticRaindrops on Twitter [4emsmom}. I'm following you in Google Friend Connect. I love the Mountain Zebra--second choice would be the Tasmanian Orange! OH MY! THIS IS THE SMARTEST THING I'VE EVER SEEN. My purse is used for school needs and everyday needs. & i can never find anything wether its a pencil to take my notes or my pack of mints. NOT ONLY WOULD I LOVE IT, BUT MY BOYFRIEND WOULD LOVE IT. When I'm driving and tell him to grab something out of my purse for me, I think he just might hate me cause i always get the URGH noise because its such a mess. I'm tired of trying to clean every other day if not everyday. I WOULD LOVE A... Joey Junior Original Purse Organizer in Pretty in Pink! i love the Original Purse Organizer | Classic Fabric in British Tan! I follow Georgia mist on Twitter @DolphinV27! I follow mystic raindrops on Twitter @DolphinV27! I love the zebra print ones! I like the original purse style organizer in Pink. Thanks for the chance. I would choose Blue Lagoon. What a beautiful color and easy to see in the purse as well. I would like it in black! Original in African Leopard!!! Sooo pretty! Also, i've entered the flat iron giveaway and the chocolates too mmmm!!!! 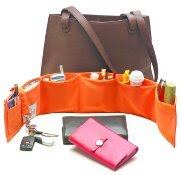 I like the Original Purse Organizer with Classic Fabric in Tasmanian Orange. I'd like the Original Design in Candy Apple Red! I like the Joey Junior Original Purse Organizer in midnight black! :) This is a great organizational tool! I want the Original Purse organizer in classic fabric in Pretty in Pink!! Awesome product! I would adore the Joey Junior in African Leopard! Thanks! I like the original in midnight black. Thanks! I love that big organizer in hot pink! I agree that a black purse NEEDS something bright inside to find stuff. I am also a public Google follower. I'd pick the Joey Junior Original Organizer in the Zebra Print- These look so awesome! I entered the Seventh Generation giveaway as well! I like the original purse organizer in Blue Lagoon! Like you I would have to go for the Pretty in Pink Original Purse Organizer. I'd be able to actually see it in my purse and it would remind me to put items back that belonged in it! My husband would appreciate it too since I seem to decide at the last minute to change purses!! i like the original in pretty pink! I really need one of these.. My purse is a mess.. I can never find anything..lol.. I like the joey junior mini in african leopard. The style Joey Junior that I'd love to own is: Original Purse Organizer | Luxury Ultra Suede and the colour: Tahitian Sand! I like the original organizer in "pretty in pink"
I sent an email to subscribe to the Joey Jr. newsletter. My favorite is the original in Rose Red. I would choose the original style purse organizer in Pretty in Pink. I subscribed to the Joey Junior newsletter.